Abstract. Land models require evaluation in order to understand results and guide future development. Examining functional relationships between model variables can provide insight into the ability of models to capture fundamental processes and aid in minimizing uncertainties or deficiencies in model forcing. This study quantifies the proficiency of land models to appropriately transfer heat from the soil through a snowpack to the atmosphere during the cooling season (Northern Hemisphere: October–March). Using the basic physics of heat diffusion, we investigate the relationship between seasonal amplitudes of soil versus air temperatures due to insulation from seasonal snow. Observations demonstrate the anticipated exponential relationship of attenuated soil temperature amplitude with increasing snow depth and indicate that the marginal influence of snow insulation diminishes beyond an effective snow depth of about 50cm. 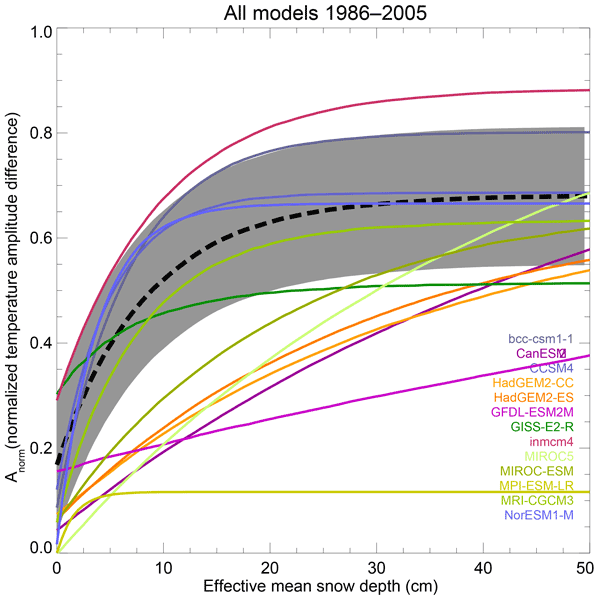 A snow and heat transfer metric (SHTM) is developed to quantify model skill compared to observations. Land models within the CMIP5 experiment vary widely in SHTM scores, and deficiencies can often be traced to model structural weaknesses. 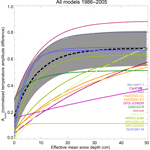 The SHTM value for individual models is stable over 150 years of climate, 1850–2005, indicating that the metric is insensitive to climate forcing and can be used to evaluate each model's representation of the insulation process. How to cite: Slater, A. G., Lawrence, D. M., and Koven, C. D.: Process-level model evaluation: a snow and heat transfer metric, The Cryosphere, 11, 989-996, https://doi.org/10.5194/tc-11-989-2017, 2017. This work defines a metric for evaluation of a specific model snow process, namely, heat transfer through snow into soil. Heat transfer through snow regulates the difference in air temperature versus soil temperature. Accurate representation of the snow heat transfer process is critically important for accurate representation of the current and future state of permafrost. Utilizing this metric, we can clearly identify models that can and cannot reasonably represent snow heat transfer.